Bushman Equipment, Inc, a manufacturer of custom-engineered material handling solutions, four custom-designed screw lifts to a Wisconsin customer— one of the world’s leading producers of brazed aluminum heat exchangers. Each of the Bushman® screw lifts measures nearly 37’ long and 6’ wide and is raised by eight 5” diameter screws. All of the screws are connected through drive shafts and bevel gear boxes, and driven by a single 50 HP electric motor. Lifting capacity is 145,000 pounds and lift stroke/travel height is nearly 8’. One of the units features additional mechanical functions including a power shuttle that allows for placement or repositioning of loads and a “kick stand” that safely holds the load in-position to allow access to all sides while on the lift. The units are pit mounted so a great deal of the machinery is below floor level. The machines are used during the fabrication of the heat exchangers. 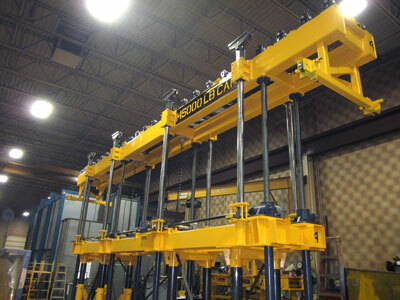 The company is a repeat customer, as it had been using three 80,000 pound capacity Bushman® lifts for years. The Project Manager complimented Bushman at its plant expansion grand opening ceremony “for delivering all of the lifts ahead of schedule and having flawless startups”.